I’m just back from a quick trip up to Tacoma WA to visit my sister Sally. It is truly beautiful up there and I had a great time but I also experienced the danger of thrifting while traveling. It turns out that very near my sister is a HUGE antique mall filled with amazing things at incredible prices! Big things! Will-not-fit-in-the-overhead-bin things. Why do I only find these places far away from my home? Ohio also seems to be populated exclusively by people who posses astonishingly cool vintage items that they are happy to sell very cheaply. I restrained myself to paper items that were easy to pack but I’m developing a dream that revolves around a truck, the open road and low gas prices. But for now I’m back home and happy to report that my latest project is up over at Mod Podge Rocks. This one manages to combine my wonderful grandmother’s love of donuts, my wonderful mother’s ability to make delicious donuts* and my need to clean out the garage. A Trifecta! I was inspired by the mind-bogglingly (not a word) cool recipe wall that KariAnne did over at Thistlwood farm. But I needed to work on a smaller scale. 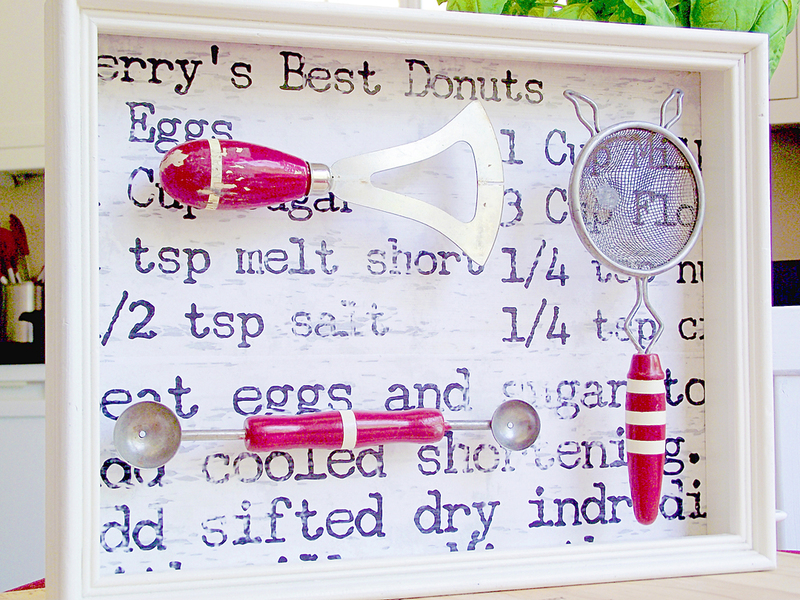 I took some of my grandmother’s old kitchen tools (can you tell I was going through some boxes recently), a blown up copy of my mom’s recipe for donuts and an old shadow box to create this: You can read all the details over at MPR but it’s pretty dang easy. Aaaand now I’m going to go make some donuts! *yes, I grew up eating home made donuts. Even I’d be jealous of me if I weren’t, conveniently, already me. Color me INSPIRED! 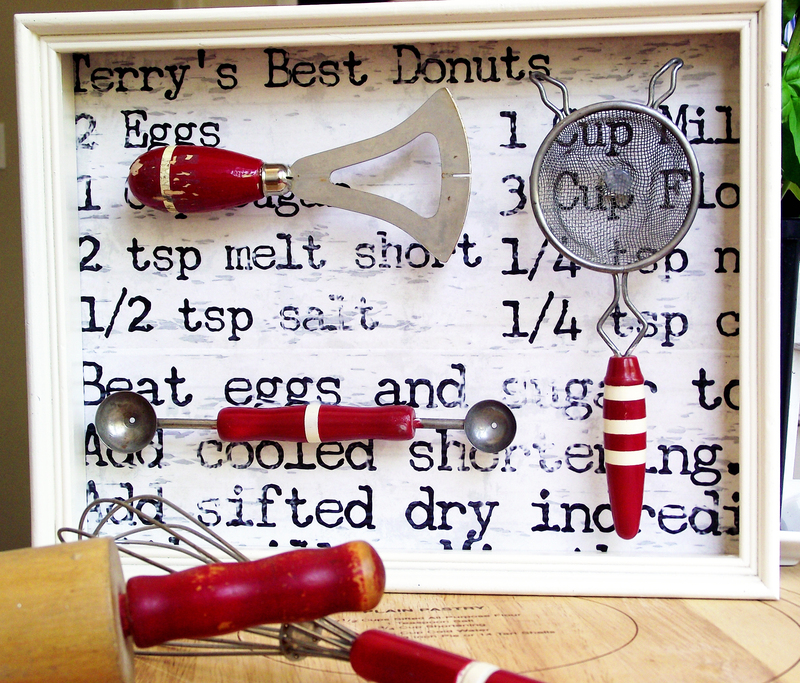 Taking meaningful items out of a box, pairing them with a cherished recipe and displaying them in an artful way is just pure wonderfulness. What a treasure. Hi David. Visiting from MPRocks. Love your style. Now following your every move, I mean your every post! I’m stalking him, too… get in line Doreen! I can’t tell you how flattered I am from this exchange! Just stay away from my pet rabbit please.